Cycle PathFrom the source to Lechlade, the Thames grows from a small stream to a river, running with clear water over a stony bed. The vegetation and Cotswold stone on the banks make ideal habitats for small creatures. On either side are marshy meadows, which are managed conservatively, and are full of flowers in Spring and Summer. The Thames is rather small compared with the man-made lakes in the Cotswold Water Park. 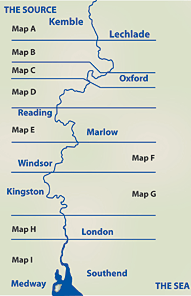 The Thames Path and river meanders between the lakes, and through fields and small villages. The Cotswold Water Park has lots of water related activity, most of which is compatible with wildlife. The lakes at Lower Moor, Swillbrook and Cleveland are good for bird-watching. There is open access along the Thames Path. Cricklade is a good place to start exploring this area, with North meadow (famous for fritillaries) within walking distance from the town centre. 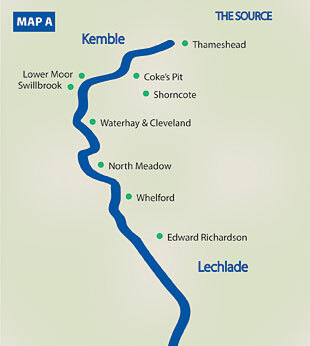 The river from Cricklade to Lechlade is officially navigational, but is suitable only for canoes.